The Lower North Shore is characterized by subarctic coastal, boreal and tundra environments. The rugged and grandiose Lower North Shore is one of the last wilderness areas in Canada. The low coastline is dotted with thousands of islands, secret coves, passages and sandy white beaches. Boulder fields and moraines covered with the blue-green mosses and lichen of the tundra stretch as far as the eye can see. World-class Atlantic Salmon rivers flow through mighty rapids and waterfalls. Wide open spaces offer breathtaking views of the Gulf of St. Lawrence. The Lower North Shore is characterized by subarctic coastal, boreal and tundra environments. It falls under the Mecatina Hills and Middle St. Augustine Hills natural regions. Its unique and fragile ecosystems attract multitudes of seabirds, seaducks, seals, and whales. Cool summers follow cold, crisp winters with heavy snowfalls. Icebergs from Greenland are carried south by the cold Labrador Current and can be viewed offshore until mid-summer. Northern Lights colour the sky on clear nights. Unfortunately, five marine species found on the Lower North Shore have been designated as endangered or threatened in Canada. 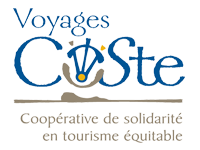 They include the blue whale, beluga whale, leatherback seaturtle and two species of wolffish. These species are at risk of forever disappearing from the Lower North Shore. 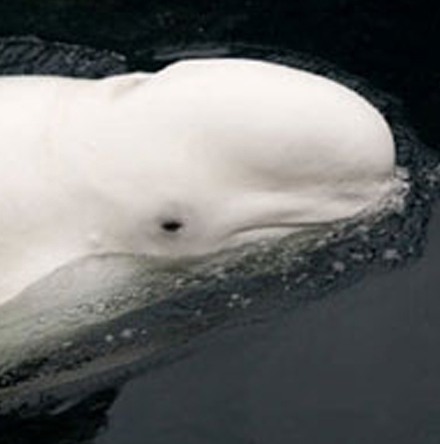 The fin whale, harbour porpoise, and polar bear are considered species of special concern. Both local and national efforts are underway to aid in the recovery of these species at risk. An abundance of small and large mammals are also found on the Coast. Unless you travel inland, you are unlikely to encounter caribou or moose. Black bears are not common but occasionally pay unwanted visits to residents’ cabins. 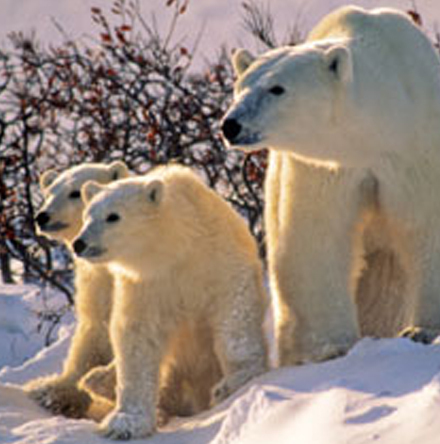 Polar bears are becoming more common in the spring. They arrive here on ice floes, and then quickly return back to the North. Common fur-bearing mammals along the Coast include arctic fox, red fox, marten, mink, muskrat, beaver, weasel and red squirrel. The Lower North Shore supports 666 species of vascular plants. Moving east, the harsher climate and changing geology mean there are fewer species. Black spruce and bogs predominate on this barren land. In summer and fall, the ground is covered with a spongy carpet of fruit-bearing plants, wildflowers, lichens and mosses. Picking the many delicious wildberries is a local tradition. 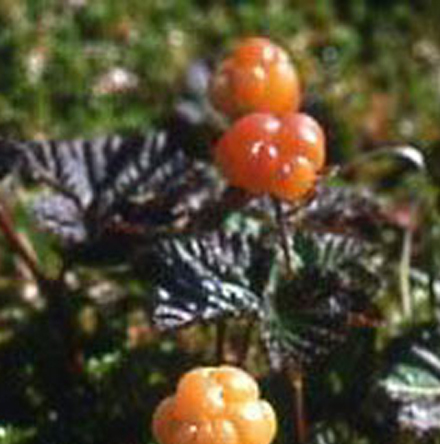 Berries that grow in the region include cloudberry (bakeapple), cranberry, crowberry (blackberry), partridgeberry (redberry), bunchberry and blueberry. Labrador tea, blue flag iris, and bog laurel are other common plants. Fernald’s milkvetch is a rare perennial that only grows in the Blanc-Sablon area and possibly on the Northern Peninsula of Newfoundland. It can be found on cliff tops and sides of limestone hills, where wind prevents snow accumulation and enables frost and thaw to strip away competing vegetation. There are sixty-five known species of fish in the waters of the Lower North Shore. Shallow shelf areas are important summer feeding and nursery areas for both groundfish, including cod and halibut, and pelagic fish, such as Atlantic Salmon, capelin, herring, mackerel, and sharks. The deep channels provide important overwintering grounds. Most of the fish stay in these waters year-round. Invertebrates such as starfish, sea anemones, sea cucumbers, limpets, sea urchins and crabs are plentiful on the rocky shores. The decline of the North Atlantic cod stocks led to the closure of the historic fishery in 1992. The closure had a major economic impact because cod once represented 65% of all catches. 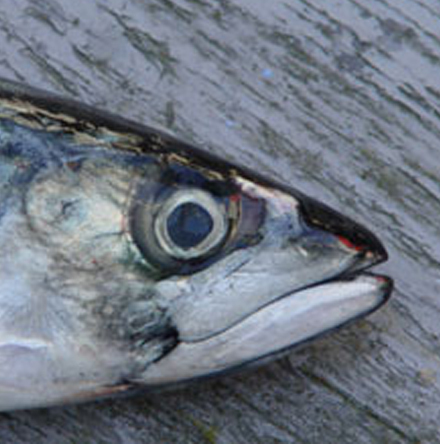 Although some groundfishing remains, the fisheries have diversified to include shellfish, herring, mackerel and capelin. The seasonal fish processing plants are important for job creation in this remote region. Some aquaculture farms produce blue mussel and scallop. In 1833, renowned naturalist John James Audubon explored the coastline collecting and sketching the wide variety of birds of the region. Ever since Audubon’s time, the Lower North Shore has been a prime destination for serious birders around the world. The rich marine environment attracts fourteen species of seabirds to the region to breed and raise their young. Fish such as capelin, lance, and small herring make up an important part of the diet of puffins, murres, and razorbills. Eiders and other sea ducks, as well as shorebirds, feed on mussels and clams. In 1925, six Federal Migratory Bird Sanctuaries were established along the Lower North Shore to protect nationally-significant bird colonies. 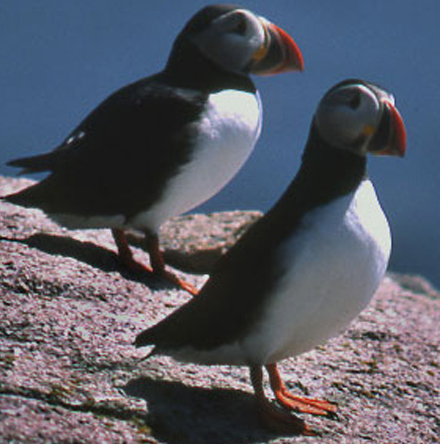 The Brador Bay Migratory Bird Sanctuary is home to Quebec’s largest puffin colony – over 20,000 birds. Thirteen species of marine mammals live in the cold waters of the Lower North Shore. The most common species of seal, harp seals, migrate from the Arctic in the late winter to give birth in the Gulf of St. Lawrence. The ice floes provide important habitat for the young seals. 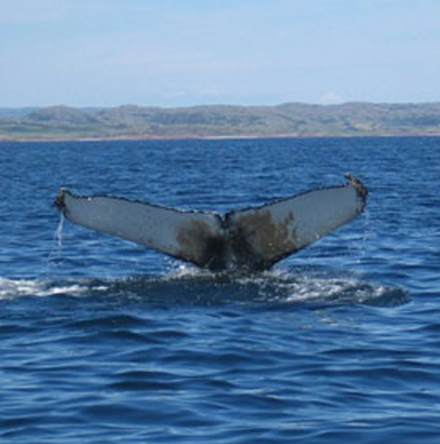 Whales, porpoises, and dolphins congregate along the coast in the summer and fall, attracted by the abundance of krill and capelin. Currently, there are more whales along the Lower North Shore than anywhere else in the Gulf.